Dupin was Sherlock Holmes before Sherlock Holmes, a genius detective who first appeared in "The Murders in the Rue Morgue," first published in 1841. In that story, the first locked-room mystery, two women are dead and only a bloody straight razor, two bags of gold coins and some tufts of hair are found in the room with their bodies. The game's afoot, as Holmes might say (Poe didn't give Dupin a nifty catchphrase). 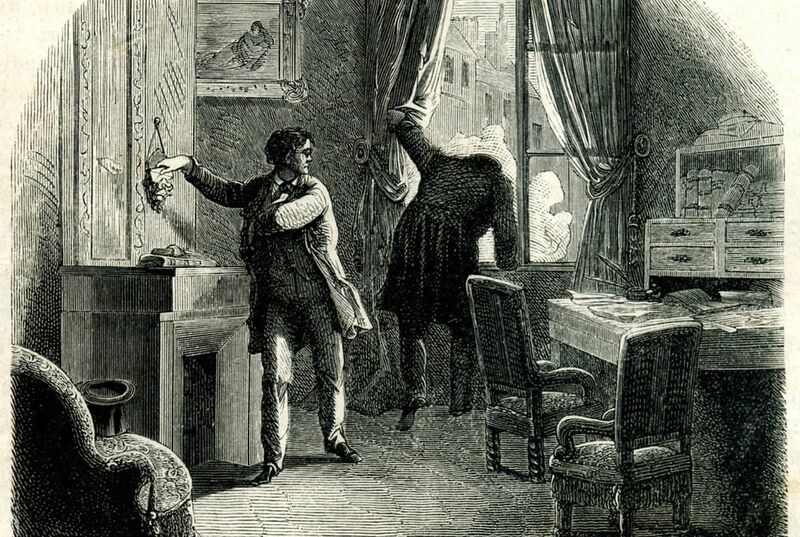 Though the roots of the detective story go as far back as Shakespeare, write historians Helena Markovic and Biliana Oklopcic, Poe's tales of rational crime-solving created a genre. His stories, they write, mix crime with a detective narrative that revolves around solving the puzzle of the "whodunit," inviting readers to try to solve the puzzle too. The key figure in such a story, then, is the detective. Poe's detective, who also appears in "The Mystery of Marie Roget" and "The Purloined Letter," sets the stage for that character. Dupin is a gentleman of leisure who has no need to work and instead keeps himself occupied by using "analysis" to help the real police solve crimes. The real police are, of course, absolutely incompetent, like Inspector Lestrade and Scotland Yard are to Holmes. Like his literary descendant, Dupin smokes a meerschaum pipe and is generally eccentric. He's also unnaturally smart and rational, a kind of superhero who uses powers of thinking to accomplish great feats of crime-solving. And the story's narrator, who is literally following the detective around, is his roommate. Dupin's roommate, unlike John Watson, remains a nameless "I" throughout the three stories, although he is equally everyday. In the Dupin tales, Poe introduced a number of elements, like the friendly narrator, that would remain common to detective stories, write Markovic and Oklopcic. "The elements Poe invented, such as the reclusive genius detective, his 'ordinary' helper, the impossible crime, the incompetent police force, the armchair detection, the locked room mystery, etc., have become firmly embedded in most mystery novels of today," the historians write. Even Arthur Conan Doyle, creator of Sherlock, had to acknowledge Poe's influence. Poe's formula appealed in the 19th century because detective stories promised that reasoning could hold the answer to every question. At the same time, with spooky overtones, they appealed to 19th-century readers' preoccupations with the occult. The detective story, writes Ben MacIntyre for The Times of London, was particularly appealing because it promised that "intellect will triumph, the crook will be confounded by the rational sleuth, science will track down the malefactors and allow honest souls to sleep at night." At the same time, MacIntyre writes, 19th-century anxieties about the Industrial Revolution and new ways of living supported the idea that evil was anonymous and everywhere. These two instincts - "faith in reason and mistrust of appearance" - are what made Victorians love detective stories, a love that endures today. This is really cool. I never knew that it was basically duplicated. Dupin and Sherlock had so much in common. The compare and contrast between Sherlock Holmes and the original inspiration for Holmes, Dupin, intrigues me as I had never heard of Poe's mystery stories before. The two mystery series are nearly identical with your comparisons of the characters and plot structures. I found this story intriguing because you unveiled it like the mysteries you wrote about. I connected with the headline because I have a fondness for Poe's poetry and short stories, but I had not heard of his mysteries. With BBC's Sherlock success, this article brings civic engagement to the pop culture sphere. This article talks about Poe's early mystery stories and how many aspects of Sherlock Holmes mysteries match his style. When I was younger, mystery series were always my favorite so I though this article was very interesting. I think part of being civilly engaged is being well read in important literature. I wouldn't say that the author of Sherlock Holmes copied Poe, he simply used one of the best authors to ever write as inspiration for his books. This shows that his book were well thought out and I personally think it makes them more enjoyable now that I know the history.